Mama Bean Parenting: Pause. Breathe. Speak. Self-doubt has edged its way into my head and isn't in a hurry to leave. If you're a parent, you'll likely have had this unwelcome and overwhelming visitor at one point or another...what if the choices I am making today are not right for my child? What if the choices that I make tomorrow close doors instead of open them, or inadvertently discourage as opposed to encourage? What if I'm not enough? Yes, today I am beaten and self-doubt is the victor. I know now that I need to pause before answering this question. I know now that crumpling into a heap and burying my face into my hands will only be mirrored back to me by my ever-learning little bean. Little bean searches my face for an answer, but I am not yet ready. I know now that I need to be truthful. I know now that changing the subject or evading the question will only result in my daughter being ill-equipped to deal with her own dramas when they decide to surface; with her own pain when it inevitably strikes. So I pause. I breathe. Little bean inches closer to me and rests her hand on my leg, but I am not yet ready. Because I know now that I need to answer this question out loud. I know now that I need to hear the problem myself, in the cold light of day. I know that finding the words, no matter how difficult, is actually the easier answer than my legacy go-to phrase of I’ll be fine. So I pause. I breathe. I speak. Little bean stares me straight in the eyes and I know that my daughter understands. In fact, she understands far better than I do. She understands that it is ok to feel overwhelmed...that it is ok to be vulnerable...that it is ok seek help and reassurance. Because in this journey of motherhood, there is a never-ending list of things we can potentially feel overwhelmed by. This role of Mother is one in which every gesture, every word, Every. Single. Moment. can literally shape another human being...this is a role with gravitas; it’s a role with responsibility. I know that I am the centre of little bean's world; the greatest honour I could imagine. But I am human, and hell, I am tired...my child is an Unsleeper; a gloriously energetic, intelligent and inquisitive Unsleeper. Which by default, makes me an Unsleeper too; a constantly racing, fuzzy-round-the-edges, always-answering Unsleeper. So with each new day and each new night, there are new opportunities to grow, to learn, to love...but also new chances to freeze, to doubt, to fear…what if...what if I’m not enough? She shuffles closer and wipes away a tear from my cheek. I pause...Her words stop me in my tracks. She doesn’t see tears as weak or shameful. She sees them as part of a process...as carriers of real and acceptable emotion. Tears that are representative of a transient state; of a state to recognise and move through, instead of ignore and become trapped within. A magnetic mix of innocence and empathy pours from her and with it, a wash of new emotion overtakes me...hope. Little bean gently leans against me and carefully wipes my eyes. I breathe...I breathe in her kindness, her softness, her calmness. And with new breath, another wave of emotion hits...relief. Perhaps in the depths of the time I once termed Night, my blurry eyes really did see through the darkness clearly enough to notice little bean’s cues; my body, my words, my Self meeting her needs even through the tiredness. Perhaps my vulnerable moments have actually complimented my stronger moments and created a more balanced picture of life for my daughter. Perhaps I really have met her needs with empathy, shown in the way that she stands beside me, tissue-in-hand and eyes full of concern. Perhaps, just perhaps, I truly am enough. And finally, I speak...victor at last: “Yes thank you, little one." Wow - so honest and uplifting! I'm still welling upl! Just got this through to my email and I had to tell you right away lol - simply wow! Nat, I'm humbled - thank you for your kind words and support! Dani, you are so right: the 'attached' journey isn't always the easy one but as you say, it's the road worth taking! Thank you for your kind words - I love that my blog can add to your courage and conviction in your parenting choices, it is truly humbling! 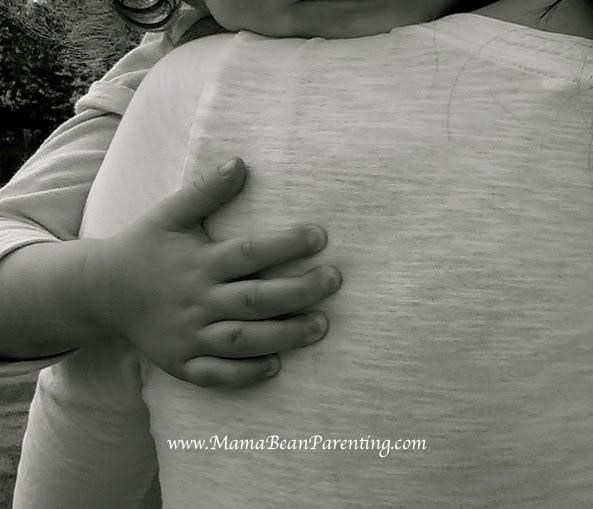 Moved me to tears... you are an amazing mama to your little one - your wonderful little bean. Beautifully written, your honesty and vulnerability are inspirational. So proud. Thank you for this - I really needed to read it today! !